Sony HDR-CX360V High Definition Handycam Camcorder offers 1920 x 1080 high definition resolution letting you record your memories in Full High Definition quality. The built-in 32GB embedded Flash memory can record and store up to 13 hours of high definition video footage with HD LP mode. It’s also capable of 60p recording and playback via HDMI and compatible HDTV4 providing stunning clarity and incredibly detailed playback of your memories. However, to enjoy a complete movie of your holiday videos is not just about connecting CX360V camcorder to HD TV with HDMI cable. In most occasions, people record dozens or even hundreds of clips. You may wonder is there an AVCHD joiner which is capable of stitching all your clips into one movie without any quality loss? 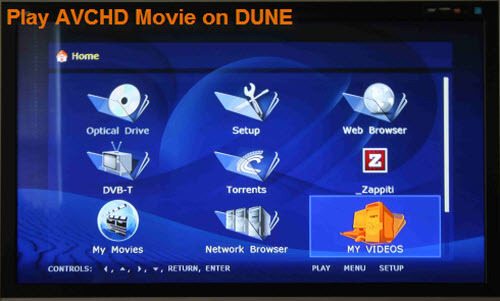 The guide introduces how to merge Sony CX360V AVCHD files in a lossless way for playback on DUNE HD Player with featured product on Mac OS X – Aunsoft Final Mate for Mac. There are two ways to import CX360V mts videos to Aunsoft Final Mate for Mac: you can directly capture/copy/extract MTS clips from camcorder to the program o you can browser videos from your computer. - Capture Sony CX360V AVCHD videos from camcorder. Connect CX360V camcorder to computer via USB cable, and launch Aunsoft Final Mate for Mac from Application folder. With built-in wizard, you can easily to capture mts video files from camcorder to the program. Select “Import” instead of Backup to quickly capture videos from camcorder. You can find imported videos under “Camcorder Tab” in the main interface of Final Mate. - Import AVCHD videos from computer. 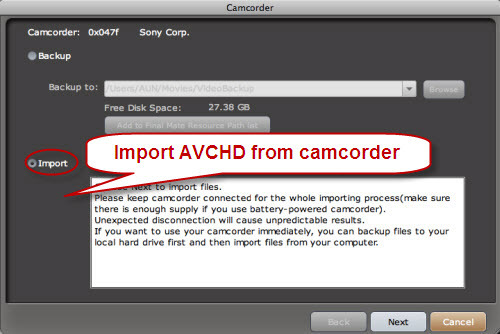 If you have already backup all your video recordings from Sony CX360V to your computer, you can browse your video path and the software will automatically show your AVCHD clips in “Resource Tab”. Click the drop-down button of “Add Movie” icon and choose “For Lossless Output” to create a blank movie. Then drag and drop video clips from Camcorder Tab (imported from Sony CX360V) or Resource Tab (imported from computer) to this new movie. In this way, all your clips have been merged together as a whole complete movie for lossless output, which means no re-encoding is involved. Click Export button directly to start output your movie. 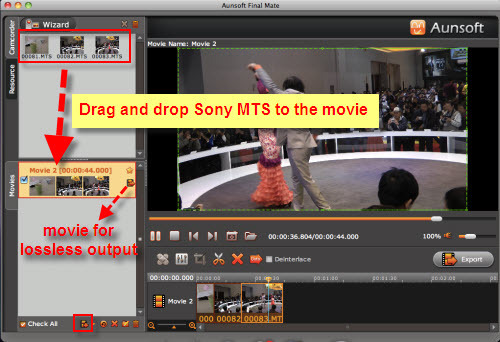 You can find combined Sony CX360V MTS videos in export folder of your Mac machine without any quality loss. Plus as no decoding or re-encoding is involved, so the whole process of lossless output will be finished in only a few seconds or minutes. Transferring merged AVCHD movie to Dune HD Player over the network 10/100 is plenty fine for streaming media. Thus, you are able to enjoy real high definition memories with your family and friends on your big TV. Tip: If you are a windows user, you may be interested to know how to combine AVCHD clips without conversion on PC.